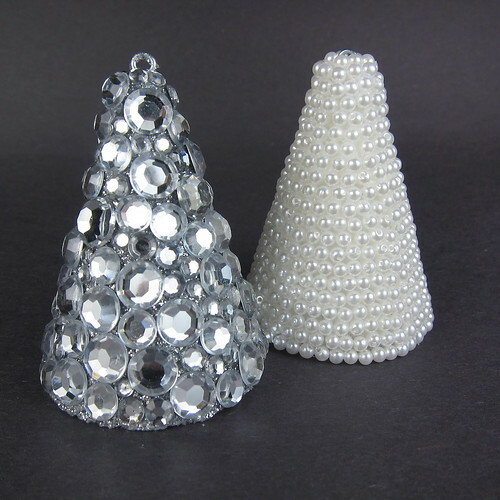 This week are making some blingy, little jeweled trees. It’s a little fiddly getting all the jewels on the trees, but I think the results are worth it. 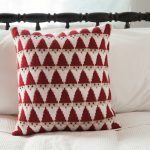 Make them with the screw eye on top to hang in your tree or create a whole forest of them for your mantle or a centerpiece. My biggest tip for making these is to use glue made for styrofoam. Most other glues will not stick to the styrofoam or worse eat through it. 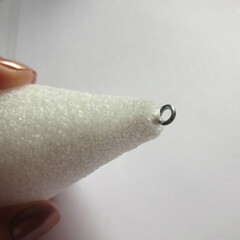 I use a glue called Hold the Foam, it is quite thick, dries clear and works perfectly. 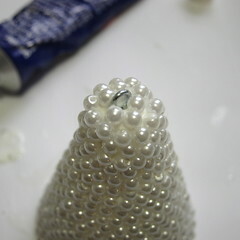 Put a bead of glue on the screw end of the eye and insert into the top of the tree form. Let dry. 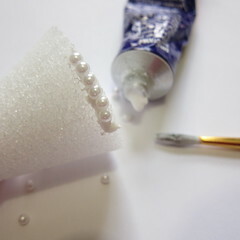 Use a paintbrush to paint the glue on a little at a time and add the pearl beads in rows. If the beads have a hole, try to postion them so the hole doesn’t show. Work your way up to the top of the tree. Don’t worry if your rows aren’t perfectly straight. 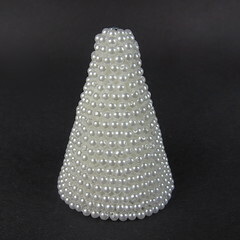 Cover the top with pearls, being careful not to complete block the eye for hanging. 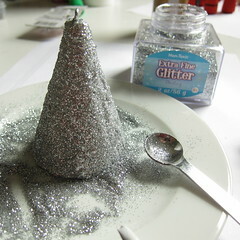 Use a paintbrush to coat the tree form with paint and then sprinkle on glitter to match your rhinestones. I found it easiest to do a section of the tree at a time. Let dry. 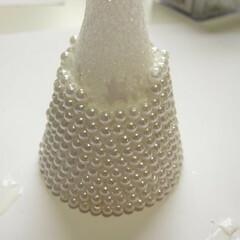 You could skip the glitter step, but the rhinestones do not cover the form completely like the pearls. I think the tree looks richer with glitter between the rhinestones instead of white styrofoam. When the glitter is dry start glueing on rhinestones. 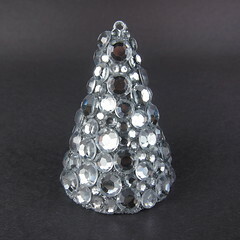 I tried to vary the size of the rhinestones throughout the whole tree, though you will need mainly small ones at the top. The more sizes of stones you have the more of the tree you can easily cover. Let dry. 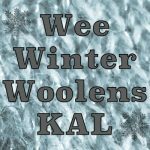 Cut a circle of felt the size of the bottom of the tree and glue it on. 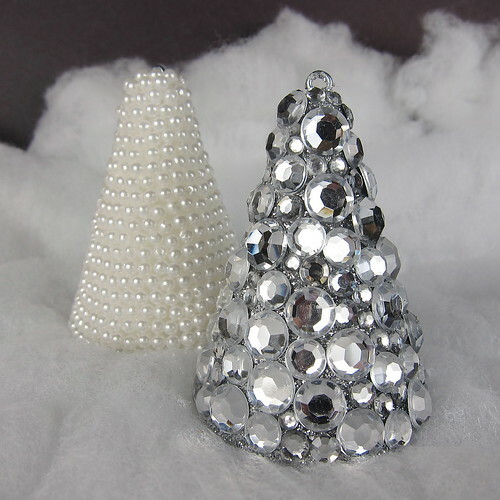 I used white for the pearl tree and grey for the rhinestone. Now set them out where they’ll catch the light for a dazzling Christmas decoration. These are great. I really like the rhinestone ones. Just found you today & can’t wait to get to the store for the cones. May even have my kids make some for gifts. Thank you so much! I’m a red hatter, and want to make the rhinestone tree, what a beautiful tree that would make for the centerpeice for our reds. We love bling. I just don’t understand what the screw eye at the top. once it is made maybe I will then. 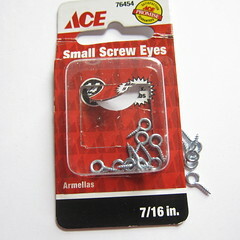 Barb – The screw eye at the top was so you could hang them on the Christmas tree as an ornament. If you want to use them just as a centerpiece then leave that off. I love these…really inexpensive. You could you the glitter stones at the dollar store. Thank you for sharing! Will be trying these trees for sure, haven’t thought of it but I have a bag full of Mardigra beads I think would be very pretty so will have to try them out. 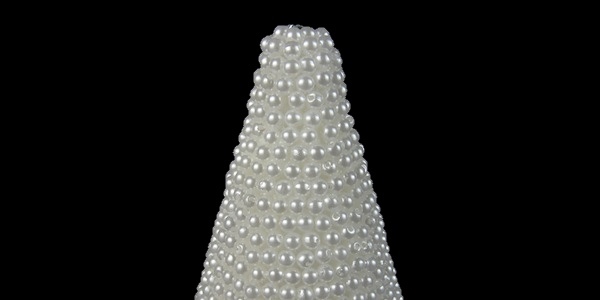 How many packages of pearl beads did you use, and how many beads per package? I only bought one bag of beads, but it was a big one, like 360 pieces. Just the cheap plastic ones you can get for under $5.00. I know I didn’t use the whole bag up. Thank you so much for the information. I can’t wait to make them, they’re beautiful. I got the rhinestones, now just need to get the beads and the rest. I hope they turn out great for you! As long as it specifies for styrafoam, would glitter aerosol paint work for this project? I have never tried it myself, but if the paint says it works on styrofoam, I don’t see why not. What kind of glue works with Styrofoam? I use a glue called Hold the Foam, but I’m sure there are other brands available too. I got it at a craft store.